Honda says it deliveries in North America may increase 14% this fiscal year to 1.48 million vehicles. April 28 (Bloomberg) -- Honda Motor Co., Japan's second-largest carmaker, forecast profit will rise 27 percent this fiscal year as auto demand recovers in North America, its largest market. Honda may boost net income to 340 billion yen ($3.6 billion) in the period ending March 31 from 268.4 billion yen a year earlier, the Tokyo-based company said in a statement today. Sales may rise to 9.34 trillion yen from 8.58 trillion yen. The carmaker's deliveries in North America may increase 14 percent this fiscal year to 1.48 million vehicles, Honda said in today's statement, as the world's second-largest auto market recovers from a recession. Industrywide demand in the U.S. may total 11.3 million in 2010, Honda Executive Vice President Koichi Kondo told reporters today in Tokyo. The carmaker's shares rose 4.7 percent to 26.61 euros (about $35.13) in Frankfurt trading as of 10:11 central european time. Honda's fourth-quarter net income was 72.1 billion yen, compared with a loss of 186 billion yen a year earlier, the company said. That compares with the 80.5 billion yen average estimate of three analysts surveyed by Bloomberg. Full-year net income for the year ended in March 31 surged 96 percent to 268.4 billion yen, the company said, as sales rebounded in the United States. and Japan and the company cut costs. Honda fell 1.5 percent to close at 3,285 yen in Tokyo before the announcement. The stock has gained about 6 percent this year, compared with a 6 percent drop for larger domestic rival Toyota Motor Corp. The carmaker based its full-year forecast on estimated average exchange rates of 90 yen against the dollar and 120 yen to the euro. A stronger Japanese currency erodes the yen value of profits made overseas. The yen appreciated to 93.29 against the dollar today from 93.94 at the 3 p.m. close of stock trading in Tokyo yesterday. U.S. industrywide auto sales rose for a fifth month in March to 1.07 million, according to Autodata Corp. The maker of the Accord sedan increased U.S. deliveries 23 percent, boosting sales to 108,262 vehicles. 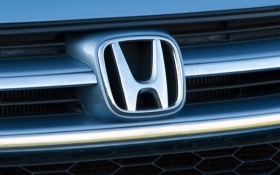 The company offered discount leases on all Honda-brand vehicles for the first time.